No more procrastination! No more. 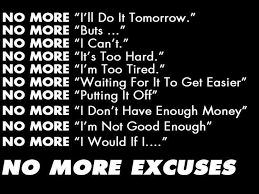 No more excuses! I hope you had a wonderful weekend! Hugs! those are all correct for sure! No excuses here!!! Thanks for sharing and have a healthy weekend! Pasting it in my forehead!